Port Charlotte 2007 CC:01 is a highly peated Single Malt, matured in French oak barrels from the Cognac area. The Port Charlotte 2007 CC:01 is the latest in the thought-provoking range of Port Charlotte Single Malts. Each is a tribute to the exceptional, heavily peated spirit that was created at Loch Indaal Distillery, until its closure in 1929. 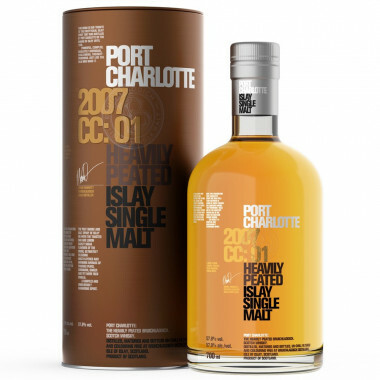 As with every Port Charlotte the starting point is rich, elegant and thought-provoking spirit. High-provenance, smoky, heavily peated barley married to the slow, Victorian, trickle distillation delivers power with finesse. Here, this fascinating spirit has been matured full term in casks of finest French oak [Quercus robur]. They previously held one of the greatest Eau de Vie, from the western Cognac region. The salt spray of Islay combines with peat smoke to mix with the toasted oak and lemon barley sugar flavours of the wood to give a complex and unbelievably rewarding dram. It’s a Port Charlotte, but not as we know it. The spirit of adventure is alive with a wonderful marriage of Port Charlotte spirit with its classic Islay DNA and truly exceptional casks from the heart of France. Nose: the DNA is Islay. Peat smoke and salt spray collide with the fruit and complexity of the classic spirit. Poached pears, vanilla fudge and sweet apricots. Toasted oak and lemon barley sugar notes rise from the glass as it warms in your hand. As it breathes, the whisky will release festive, warming aromas of cinnamon, ginger and vanilla. Palate: irresistibly complex. This dram has layer upon layer of subtle fruit flavours so characteristic of the spirit wrapped comfortingly in the blanket of peat smoke. Yet there is a new dimension to this next release of Port Charlotte. A depth of character that comes from the years of maturation in old cognac barrels. The spirit has matured slowly over the last eight years to become a beguiling spirit that shows the Port Charlotte spirit of curiosity and adventure is alive and well. The wonderful French oak gives vanilla and spice and has brought this heavily peated Islay spirit to maturity with a class and finesse beyond its years. The fruit is rich and sweet - apples apricots and plums - as is the barley sugar and lemon honey notes that reassure you this is an Islay spirit matured under watchful eyes. Finish: this whisky stays on the mind for longer than the palate and it stays on the palate for some time. Floral heather honey, zesty lemon and a nutty smoothness settle with the peat smoke that is always last to leave. A truly astonishing whisky.